After getting engaged, Anne Elise and Nick knew exactly where they wanted to celebrate their wedding day. With frequent cocktails after work, Union Station’s Grand Hall in downtown St Louis was a place that had grown special to them during their time dating. So when their dream venue only had one fall date available, Halloween was it! With Anne Elise’s big sister acting as creative director, they designed a dramatic wedding with a rich cranberry-color palette and sweet family details. Among my favorites: Anne Elis’e heirloom veil. Originally worn by her mother 30 years prior, then by her sister five years before, the chapel-length veil adorned with pearls and a cloche headpiece was the perfect something borrowed! Of course, with a wedding date of Halloween, they couldn’t forgot to add a little fun! Anne Elise and Nick not only added a trick-or-treat candy table, but the nightly laser light show on the ceiling of the Grand Hall served as fabulous surprise for their out-of -town guests. Thanks to Charis Rowland for sharing Anne Elise + Nick’s wedding with us! How did y’all meet? Tell us your love story. I moved to Terre Haute, Indiana right out of college for my first job. I was 7 1/2 hours from home in a new region where I knew no one. I spent three years in this tight-knit community, while my future husband and in-laws were across town, and yet, our paths never crossed. As I was getting ready to move to St. Louis for my next job, a Terre Haute family I had become friends with reached out to tell me about this guy named Nick who had just recently moved to St. Louis from Terre Haute as well. They asked if they could pass my number along since neither of us knew anyone, and the rest is history! When did y’all get married? October 31, 2015. It was the one fall date that our dream venue was available, so Halloween it was! Tell us about finding your wedding dress. I’ve never been the girl who had every detail of her wedding mapped out from early on, but I’ve always loved looking at wedding dresses in bridal magazines, and the one thing I did know was that I wanted a dress with sleeves and lace. My mom and mother-in-law joined me on Easter weekend in St. Louis. Our first stop showed some promising dresses, including a long-sleeve, lace, off-the-shoulder dress. It was all that I wanted on the hanger, but I didn’t love the fit once I got it on. Fast forward to the next store and I saw the same dress, and I tried it on again. Once the consultant pulled it tight and gave me a true impression of what it would fit like once it was sized for me, I fell in love! My mom, mother-in-law, consultant, and other customers nearby were ooh-ing and ahh-ing over it with me. We all knew it was the one! Did you decide to do a first look? Why or why not? Yes. I always thought that I’d be a traditional bride who waited until I was walking down the aisle, but after talking with many friends and family members, the consensus was that a first look makes for a more pleasant experience after the ceremony. I was also told that it’s really special because it’s your moment with your groom to express that first reaction, and I wouldn’t trade that experience for anything. Our photographer captured it so well. There was laughter, giddiness, awe, and lots of hugging and kissing. I’m so thankful we had time for the two of us. What made you choose your ceremony and reception venues? Did they have any special significance to you? Our ceremony was at our church, Central Presbyterian Church. This was special because being new in a city together, we were able to hunt for a church together. We landed at Central and even got to go through the New Member training class together as a dating couple. It was super special to share that journey and then say our vows in this beautiful, historic church that had become so sentimental to us. Our reception was in Union Station’s Grand Hall. It is simply stunning! During our dating time, I lived in a loft near Union Station in downtown St. Louis, and we would often get cocktails in the Grand Hall. When we got engaged, it was the first place we thought of, and after checking various venues, nothing even came close to Union Station in our book! Did you write your own vows? We did not. We chose traditional, yet beautiful and intentional, vows that we discussed with our pastor during premarital counseling. Tell us about some of the songs you used throughout your wedding and why you chose them. I walked down the aisle to “Processional and Maria” (Rodgers and Hammerstein). My favorite movie has always been The Sound of Music. There’s something so majestic and beautiful about Maria’s march down the aisle to this song, and I could think of no more wonderful song to meet my groom to! All our ceremony music involved the church’s incredible organ. “Toccata” (Bach) was the perfect song of celebration and joy for our recessional–it fit the way Nick and I felt walking away from the ceremony as husband and wife. Describe your wedding flowers. Exquisite! My amazingly talented big sister, Sara Beth, went above and beyond in her matron of honor role. She was the true creative director behind our wedding. From designing our wedding programs, invitations, save the dates, and all other print work, to designing and making my bridal bouquet, I still can’t find the words for what she did. 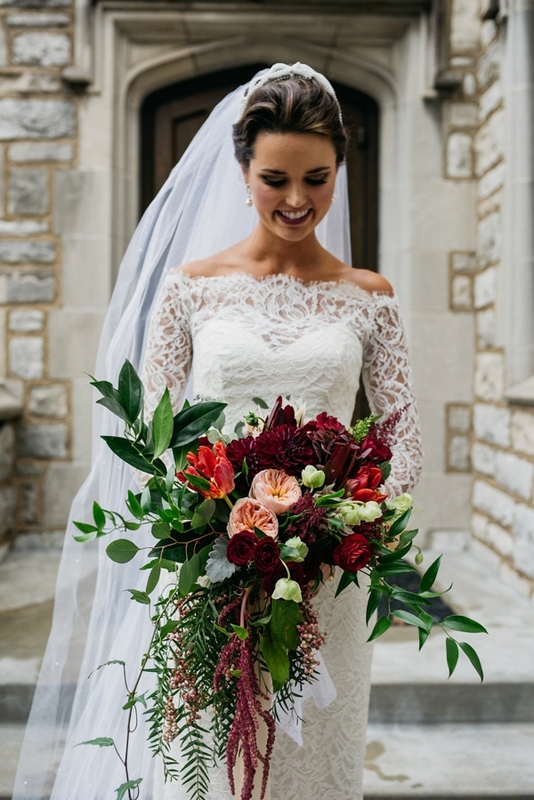 My bouquet was super full, vibrant, and earthy, with various hues of cranberry (the wedding’s main color). It was composed of dahlias, garden roses, ranunculus, hellebores, spray roses, parrot tulips, protea, astilbe, pepper berry, dusty miller, eucalyptus, Italian ruscus, ivy, and foliage. The bouquet was wrapped in silk ribbons and a piece of lace from my mother’s wedding gown. It also included a gold jewel from an arrangement at one of my bridal showers. Describe your wedding cake or dessert. Our wedding cake was a round, five-tiered, French vanilla cake covered with delicious buttercream icing, imprinted with a scattered lace design, and accented with ivory fondant flowers edged in gold. The largest layer was covered in fondant ruffles with buttercream pearls. A gold “P” monogram, placed on the side of the center layer, was a focal point, and a surprise red velvet layer (my favorite flavor!) was enjoyed by not only my groom and me, but by several other guests as well. I worked with the Cakery to design our cake, and it was truly the prettiest (and tastiest) cake I’ve ever seen. Our favorite detail of the wedding was: The light show at our wedding reception was one of our favorite details. Union Station in St. Louis does a variety of beautiful laser light shows on the ceiling of Grand Hall each evening. Our guests (who were mainly from out of town) had no idea to expect it, so it was a fun surprise. Guests attended a cocktail hour in one portion of Union Station following our wedding ceremony before being led into the reception in Grand Hall where a light show was beginning. The laser light show has coordinating music and imagery on the ceiling, creating a musical movie of sorts. It feels like you’re at Disney World! Another detail we loved was the trick-or-treat station at our reception. My mother-in-law took our vision for a trick-or-treat stand and ran with it. Some of our favorite candies (in mainly gold, white, and cranberry tones) filled various tall glass containers on a table next to the photo booth. Guests could go at any time during the reception to pick up a treat bag and fill it as they pleased! Did you have something borrowed, blue, old, and new? If so, do tell! I borrowed a family veil, first worn by my mother 30 years ago and then by my sister five years ago. The chapel-length veil is adorned with pearls and attached to a pearl cloche headpiece. My garter was wrapped in light blue ribbon, and my something old was lace from my mother’s dress, wrapped around my bridal bouquet. My lace Casablanca wedding gown was new! How did you plan for your marriage while planning your wedding? We took part in premarital counseling with our church’s pastor. We would meet once every few weeks for the three months prior to the wedding. We started our sessions by taking an intensive test that analyzed our personalities and how we handle others/relationships. We discussed the test results with our pastor and talked about possible conflicts/victories that may result from our two types. We loved every minute of these special sessions with our wise pastor, and only wished it never had to end! In the hustle and bustle of planning, this was a serene time that helped us gain focus and perspective. We also made a point to have date nights where we weren’t allowed to talk about the wedding, which I highly recommend! What was one way you saved money or cut costs at your wedding? I am blessed to have creative family members. My sister saved us so many costs by cutting any design charges from our wedding invites, paper goods, etc. She only charged us for the materials, which was a huge help. 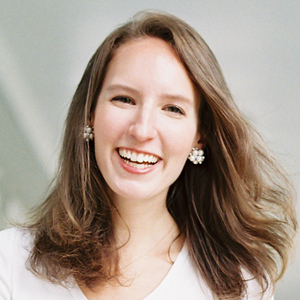 My childhood babysitter (and our family’s dear friend) volunteered to be our wedding day coordinator so that we could enjoy the day and not worry about all of the details lining up. For the ceremony, we used a lot of greenery and candles for the front of the church, instead of large floral arrangements. Central Presbyterian Church’s sanctuary has massive, colorfu,l stained-glass windows throughout and lots of natural light, vaulted ceilings, and large lanterns; it’s a beautiful place and didn’t need much extra. What advice do you have for folks currently planning a wedding? Decide what’s right for you! A wedding is a small glimpse into the soul of a couple. Whatever style fits you, go for it and don’t look back. Weddings of all kinds are a lot of work, but I don’t regret one ounce of time we spent pouring into this most memorable day of becoming one with my husband. It’s one of the only days in your life when you’re truly surrounded by your very favorite and most loved people. Be in the moment and celebrate such a joyous and monumental occasion with no regrets! What’s next for you as a couple? What memories are you looking forward to making together? We just bought our first home in our favorite neighborhood in the city! Our golden doodle, Murphy, loves having a backyard and room to play. We look forward to having friends over for house parties. Up next for our family…we’d like to plan a trip to Europe next year. Italy, perhaps? We shall see! Every year, we do our best to fill our annual print edition with advice and tips that will help you not only plan your wedding, but also (more importantly), help you and your fiancé prepare for marriage. We ask every couple we feature how they go about preparing for life after the big day, and were so happy to include many of their answers in V8. Please enjoy their words of wisdom every Sunday here on Southern Weddings! Boy howdy, do I have a treat for y’all today. 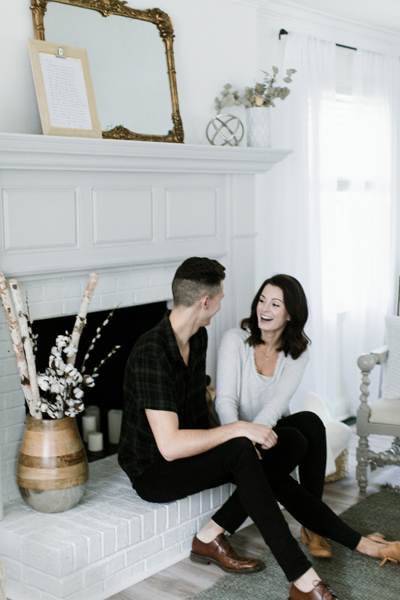 Not only did our friend and newlywed Hope Houser send over photos of the beautiful home she shares with her husband, Michael, but we have the “before” photos to share, too! 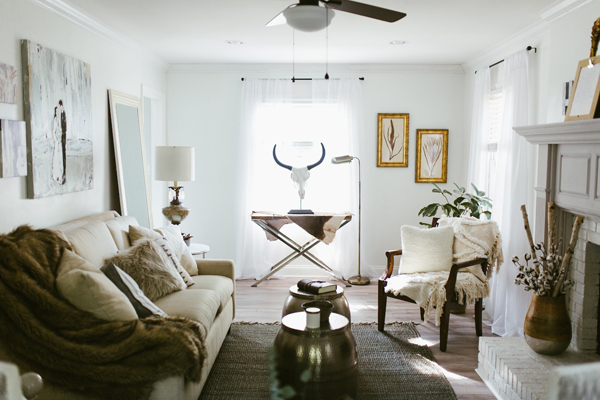 The home these two have created is cozy, inviting, cohesive, and filled with sentimental pieces, from the painting of their first look to the cactus art in honor of Michael’s home state. 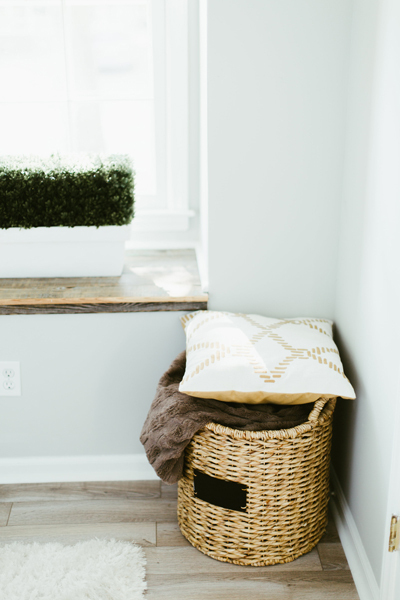 Add in an enviable man cave, a facade-flip worthy of Joanna Gaines, and an interview filled with sweet wisdom, and my (and probably your) Friday is complete! Please enjoy, friends! Thanks to Sophie Brendle for the beautiful after photos of Hope and Michael’s home! P.S. 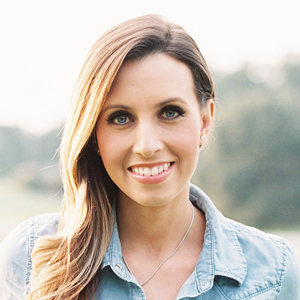 You may recognize Hope as Lysa TerKeurst’s daughter. 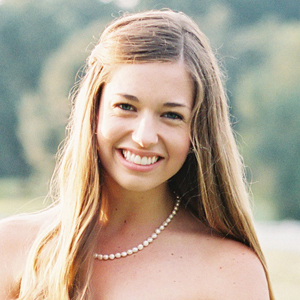 Read more of her mama’s advice for mothers-of-the-bride here! Tell us a little bit about yourselves. Michael: I grew up in Tucson, Arizona. Although I miss the dry heat at times, Charlotte has become my home. I have an older brother and sister as well as four younger siblings. I loved growing up in a big family and I hope to start my own with Hope in the next few years! Until then I am pursing a double major in business as well as working towards my career goal to become a Chick-fil-a operator/owner. Hope: My parents have lived in the same house my entire life in Charlotte, North Carolina. My dad has owned his Chick-fil-A for 25 years. My mom is the president of Proverbs 31 Ministries. She has written 19 books and speaks all over the world! I have two older brothers and two younger sisters. Tell us your love story in one sentence. 20 questions while driving up a mountain top was the best way for us to get to know each other – I love to ask questions, and hearing Michael’s answers made me fall in love. What is your favorite part of being married? Hope: Watching Michael cook the yummiest dinner, jazz music playing in the background, favorite candle lit, and not having to say goodnight after :) Michael: My favorite part of being married is being able to start my day and end my day with my best friend. I can’t put into words how awesome it is to be in love with your best friend. What has been the most surprising thing about marriage? Michael: The most surprising thing about marriage is that I never stop learning more about my wife. Marriage is a constant work in progress, and I mean that in a good way. Tell us about the process of moving in together. Michael has given me such freedom to bring all my crazy ideas to life with our home. Some have totally failed, but it’s nothing a little patch-up work or paint won’t fix! The best advice we have would be to give yourself the freedom to experiment. Either you learn a lesson of what not to do next time, or it turns out great! It’s a win/win. Which room in your home is your favorite, and why? 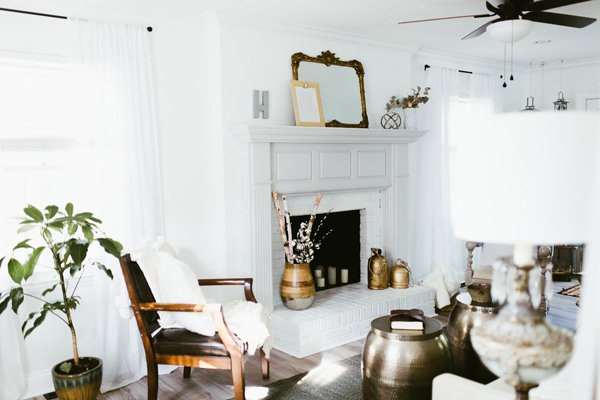 Hope: Our living room — we love hosting our friends and family there! Michael: My man cave. It’s the best napping or movie room! Where do you splurge and where do you save when decorating? 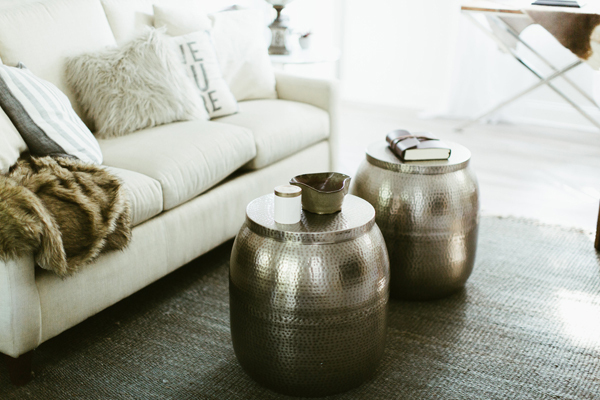 I like to have at least one statement piece in every room, and those are normally the splurge items: our chairs in our living room, our cowhide rugs, the House Of Belonging sign above our bed. What is your favorite memory from your wedding? Hope: Our band was seriously amazing. We danced under lights in this huge glass ceiling atrium. It truly was the most magical winter wedding. Michael: My favorite memory was watching Hope walk down the aisle. I know it’s, cliche but it truly is a breathtaking moment. Along with that, I love that I’ll always be able to reminisce about the best day of my life with friends and family who were there. How do you remember your wedding in your home? We have lots of wedding pictures all throughout the house, the Bible we had our guests sign is on our coffee table in the living room, our wedding painting is hanging in the living room, and we have an album of guest photos from our photo booth! What different decisions, if any, would you make for your registry if you knew then what you knew now? Wait a few weeks until you start spending the gift cards from either presents or reimbursements. We could have used them for so many practical items that we didn’t realize we needed until a few weeks living together in our home. What’s your favorite place to find recipes? I watched the movie “Chef” a few weeks back and ever since I’ve been on a food truck kick. I’ll look for food truck recipes online and work them into our menu for the upcoming week. Try homemaderecipes.com! How does your family handle finances? We both love growing our savings and giving. Don’t get me wrong, spending is fun, but we want to establish good patterns early on. We’ve had to just decide what things are necessary, and what we can wait on. I would recommend using a budget sheet – once you use it for a few weeks consistently, it will become a really wonderful habit! What’s your best tip for balancing your relationship and other life priorities? Saying no to some things has been so beneficial for us. 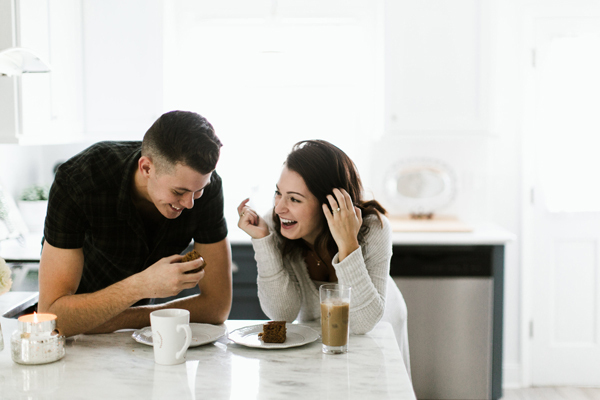 We’d recommend allowing yourself to sometimes turn down stuff so that you can use your newlywed time to grow closer together. We’re all about that “quality time” love language! This has been an area where lots of communication is needed and we sometimes fail, but we love to learn! Do you have a favorite date night idea to share? Our favorite night would be cooking dinner at home, eating at our farm table, then venturing upstairs with a glass of wine to watch whatever show we;re hooked on at the moment. Currently, it’s “Parenthood.” So good. What is one small way you love or serve your spouse? Hope: I LOVE walking into a clean house. I travel a lot with my job, so Michael is always serving me by cleaning the house before I get home from a trip. Michael: I love when Hope sends me encouraging messages, phone calls, or notes throughout my week about stuff I forgot I told her about, like a big exam coming up, a presentation for work, or a new workout routine. It could be anything, but her intentionality always makes for a better day. Do you have children? Both of us grew up with big families, so we would love to have a big family, too! We want to wait 3-5 years to have kids. Adoption is something we both have had our hearts set on for a while! Before getting married, I wish someone had told me… My mom always tell us this: “When you wish for someone else’s good, you have to be able to handle the not-so-good that comes with it. It always comes as a package deal.” We knew this before we were married, but it’s something we are constantly reminding ourselves of. Comparison is so dangerous in a marriage! This year, our family is most excited about… going to Israel together in a few months. I have been, but Michael hasn’t, and we are SO excited to experience it together as newlyweds. Thank you so much for sharing your hearts and home with us, Hope and Michael! What is the quote over the bed? Where did you get the bedding with the brown comforter? I love it!